1 You've already learned that all living things are made up of cells. Each cell is a living building block. One cell can make up a simple organism. Hundreds, thousands, or even millions of cells can be put together to build bigger and more complex organisms. Cells are not all the same. The cells that make up your skin are different from the cells that make up your blood. The cells in a fish are not the same as the cells in a dog. The cells in a rose are not the same as the cells in a tree. Cells need to be different to do different jobs. 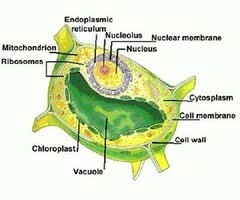 Even though there are many kinds of cells, all cells can be put into one of two groups: plant cells and animal cells. 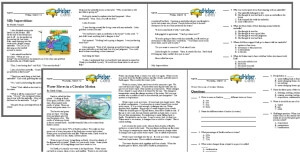 Today, you are going to learn about plant cells. 2 Trees, grass, flowers, and moss are all plants. They are all made up of plant cells. What makes a plant cell different from an animal cell? One difference is that plant cells have cell walls. A cell wall is layer of stiff material that goes all the way around the outside of the cell. A cell wall helps to protect the cell from damage. It also helps to hold the shape of a cell. Animal cells do not have cell walls. Plant cells also have structures that help them make their own food using sunlight. These structures are called chloroplasts. Chloroplasts are what give plants their green color. Animal cells do not have these structures. They cannot make energy from sunlight.